I often say "Don't DIY everything for your wedding." You just can't. Time wise, it's kind of difficult. But skill wise, it's kind of impossible. If I'm being completely honest, not everyone has the vision and skill to DIY some wedding projects. 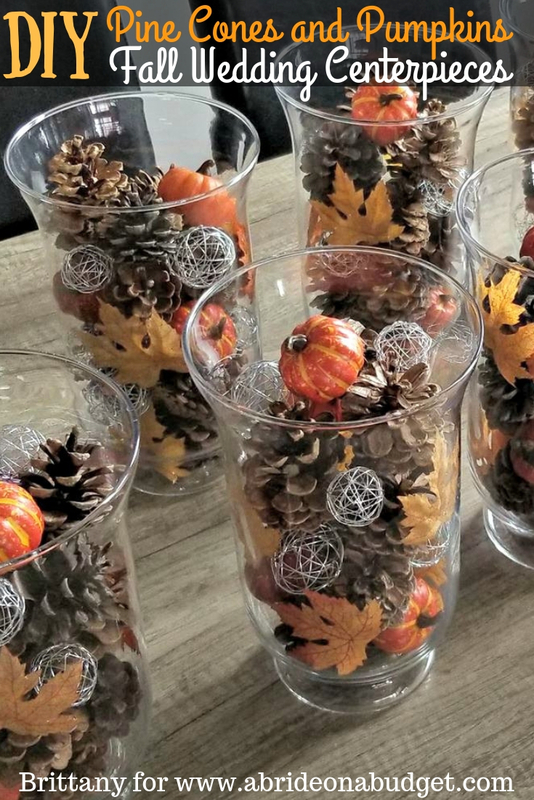 So that's when a beautiful DIY crosses my eye -- like these gorgeous DIY Pine Cones and Pumpkins Fall Wedding Centerpieces that Brittany made -- my heart skips a beat. Her centerpieces are incredible. And gorgeous. And festive. Did I mention they're incredible? When I saw them, I flipped out. They're basically perfect. She added a silver crinkle wire bell and that takes them up a notch and that little extra touch is exactly what you need when you DIY something. See, the secret when you're DIY'ing wedding items is that you don't want them to look like you made it yourself. You want to make it yourself, of course, but you want your guests to think you paid a professional. If you're getting your pine cones from outside (as you should because don't pay for nature), you need to prepare them for crafting first. We actually wrote a full post about how to prepare your pine cones for crafting. Gently place the leaves against the side of the vase, then fill with pine cones, pumpkins, and silver balls. Work in small batches because you don't want the leaves to fall into the center of the vase. You'll never see them and that will waste them. You also don't want to just dump everything in because then you won't be able to see it all and it will look like a mess. If you have table number flags, you can stick them in the top. And, if you want to jazz them up a little, put square mirrors under them. The variety of geometric shapes will play on your guests' eyes. Brittany has a few pumpkins to place around these, including one which will have the table number on them. She told me they're boxed up for her wedding this weekend (Ahh! It's her wedding week! So exciting! ), so maybe she'll be kind and send us a photo of them set up after her wedding! BRIDAL BABBLE: What is your favorite part of these DIY Pine Cones And Pumpkins Fall Wedding Centerpieces? There are gorgeous!Simple and so nicely put together! Thank you for sharing at Celebrate It!